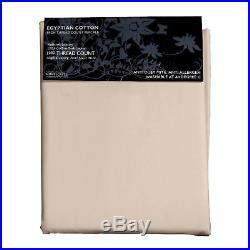 Super King Size Mink Beige Egyptian Cotton Duvet Cover Set 100% Cotton. Sizes: Single 135x200cm (54x79") Double 200x200cm (79x79") King 230x220cm (91x87") Super King 260x220cm (102x87"), Single includes 1 housewife pillowcase Double, King and Super King includes 2 housewife standard size (UK) pillowcases. Pure combed cotton yarn spun out of Egyptian cotton fibres in 1000 thread count density in satin stripe weave. Woven with single count yarns and shouldn't be confused with coarser similar pictured inferior bedding available online. The high quality duvet covers have hand sewn buttons and button holes and the housewife pillowcases included have an envelope closure. Washable at home and this range of bedding gets softer and more comfortable with each wash. Manufactured to look good and last long. Coordinating fitted sheets, flat sheets and pillowcases of various shapes and sizes (body pillowcase, V pillowcase and others) available with HOMESCAPES. Range available in four colours. This Homescapes bedding has been manufactured with long staple cotton fibre spun after finely combing the superior Egyptian cotton fibres in one of the most advanced spinning mills in the world. The fabric is then carefully woven and inspected to make it suitable for the exacting standards of the luxury hotels worldwide. This is a true 1000 thread count fabric as the yarns and single count are not twisted. This matters to you as a consumer as you are getting a heavier quality of fabric, which will last for a long long time and will improve with each wash. It's anti dust mite due to a high density weave and is also washable at 40 degrees, in your domestic washing machine, killing most allergens and mites. This bedding range has been manufactured in an environment, where quality is paramount. This is exactly the same as you would see in a 5 star hotel bedding. Please Note: Since computer monitors vary in colour, the actual colour of the item may slightly differ from what is shown on your computer screen. For more colours, sizes or patterns of an item, please send us a request and within 24 hours you will receive an answer. While we work to ensure that product information on our website is correct, manufacturers may alter their product information. Actual product packaging and materials may contain more and/or different information than shown on our website. You should always read the labels, warnings and instructions provided with the product before using or consuming it and not solely rely on the information presented on our store. This notice does not affect your legal rights. Our company is committed to providing each customer best service. Wish you have good shopping experience in. Your feedback is very important. For more similar interesting and amazing to go.. The item "Super King Size Mink Beige Egyptian Cotton Duvet Cover Set 100% Cotton" is in sale since Friday, January 05, 2018. This item is in the category "Home, Furniture & DIY\Bedding\Bed Linens & Sets\Bedding Sets & Duvet Covers". The seller is "bestshop_giftcenter" and is located in Braintree, Essex. This item can be shipped to United Kingdom, Antigua and barbuda, Austria, Belgium, Bulgaria, Croatia, Cyprus, Czech republic, Denmark, Estonia, Finland, France, Germany, Greece, Hungary, Ireland, Italy, Latvia, Lithuania, Luxembourg, Malta, Netherlands, Poland, Portugal, Romania, Slovakia, Slovenia, Spain, Sweden, Australia, United States, Russian federation, Canada, Brazil, Japan, New Zealand, China, Israel, Hong Kong, Norway, Indonesia, Malaysia, Mexico, Singapore, South Korea, Switzerland, Taiwan, Thailand, Bangladesh, Belize, Bermuda, Bolivia, Barbados, Brunei darussalam, Cayman islands, Dominica, Ecuador, Egypt, Guernsey, Gibraltar, Guadeloupe, Grenada, French guiana, Iceland, Jersey, Jordan, Cambodia, Saint kitts and nevis, Saint lucia, Liechtenstein, Sri lanka, Macao, Monaco, Maldives, Montserrat, Martinique, Nicaragua, Oman, Pakistan, Peru, Paraguay, Reunion, Turks and caicos islands, Aruba, Saudi arabia, South africa, United arab emirates, Ukraine, Chile.